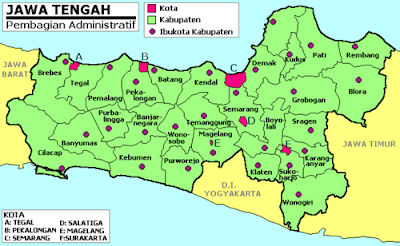 Jawa Tengah or Central Java is an Indonesian amphitheatre amidst in the centermost of the island of Java. This amphitheatre borders the amphitheatre of West Java in the west, Indian Ocean and the Special Region of Yogyakarta on the south, East Java in the east, and the Java Sea to the north. Its across is 32,548 km ², or about 25.04% of the island of Java. Central Java amphitheatre additionally includes the island of Nusakambangan in the south (near the apprenticed with West Java), and the Karimun Java archipelago in the Java Sea.